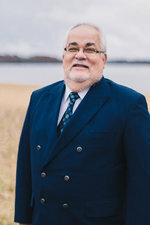 Cláudio Divino moved to Elizabeth City in the summer of 2014 to begin his ministry at MACU as an Associate Professor of Cross-Cultural Ministry. He had been a successful minister in Brazil for 15 years before coming to the United States in 1993. His last ministry, in the Rio de Janeiro metropolitan area, took place in a church that grew from 650 to 2,500 in a 5-year period. Dr. Divino has served God in His Church in Brazil as: Editor of Bible School Lessons Publication (1984-1993), General Director of National Youth Department (1977-1978), District Superintendent (1984-1993), General Secretary of Administration (1988-1992), Professor of ICS at the Centro de Formação Teológica [Theological Formation Center] and an Honorary Member of the AEVB—Associação Evangélica Brasileira [Brazilian Evangelical Association] (1992). After finishing his graduate studies at Emmanuel, Dr. Divino felt called by God to minister to the Portuguese-speaking people who live in America. In association with the Hisportic Christian Mission and the Orchard Group [ex-Go Ye Chapel Mission], and with the support from several Christian churches from East Tennessee, he planted the Antioch Christian Church in Port Chester—in the New York City metropolitan area. In June of 2003 Dr. Divino left the Antioch Christian Church to assume the position of ICS Professor at the Crossroads College at Rochester, Minnesota. On December 2010, he accepted the position of Vice-President of Academics with the same college. Dr. Divino has been a member of the NACC [North American Christian Convention] Continuation Committee (1999-2001; 2004-2006; 2007-2010) and continues to serve as a chaplain with the United Chaplains State of New York, Inc. (2002-present). Dr. Divino has been a delegate representing his home country of Brazil in three different mission conferences in Temuco (Chile), Quito (Ecuador), and São Paulo (Brazil). In 2004, Dr. Divino delivered the Forrest F. Reed Lecture, [Dynamics of Unity and Diversity in Congregational Ministry from an Ethnic Perspective] sponsored by the Disciples Historical Society at the Phillips Theological Seminary, in Tulsa, Oklahoma. He has published numerous popular level articles in such publications as The Lookout and Christian Standard. He is a regular presenter of workshops on topics related to cross-cultural ministry at state and national conferences/conventions. Dr. Divino has a passion for missions. He has led numerous short-term mission trips to such places as India, Philippines and multiple African nations. He takes his cross-cultural relationships seriously, having contacts in many parts of the world, to where he usually takes his students.